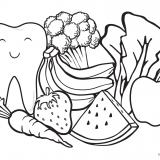 For healthy teeth, choose healthy, whole food snacks, like fruit vegetables, and cheese. As your child gets older, raw or roasted nuts are also great options for a healthy smile. If brushing is a struggle for your infant or toddler, four hands can be better than two. Have one person place the child’s legs around their torso, while the child lies back into the partner’s lap for brushing teeth. If a partner is unavailable to assist you, we recommend sitting on the floor, with your child’s head in your lap to achieve the best access. For brushing the teeth of children less than 2 years old, use a rice grain amount of fluoride toothpaste; even though the child will likely swallow the paste, this is a safe and helpful dose of fluoride for your child. For children over the age of 2, a small pea-sized amount of toothpaste is recommended. Remember to keep toothpaste out of your child’s reach, and always have an adult dispense toothpaste for children less than eight years old. Although your child may seem independent at five years old, it is best to supervise brushing at least before bedtime until your child is 8 years old, to ensure that proper cleaning is taking place. Introduce flossing as soon as you notice that child’s teeth are touching. We recommend floss sticks as the simplest means of cleaning between young teeth. If flossing is a struggle for your child, concentrate on cleaning between the molars in the back of the mouth. 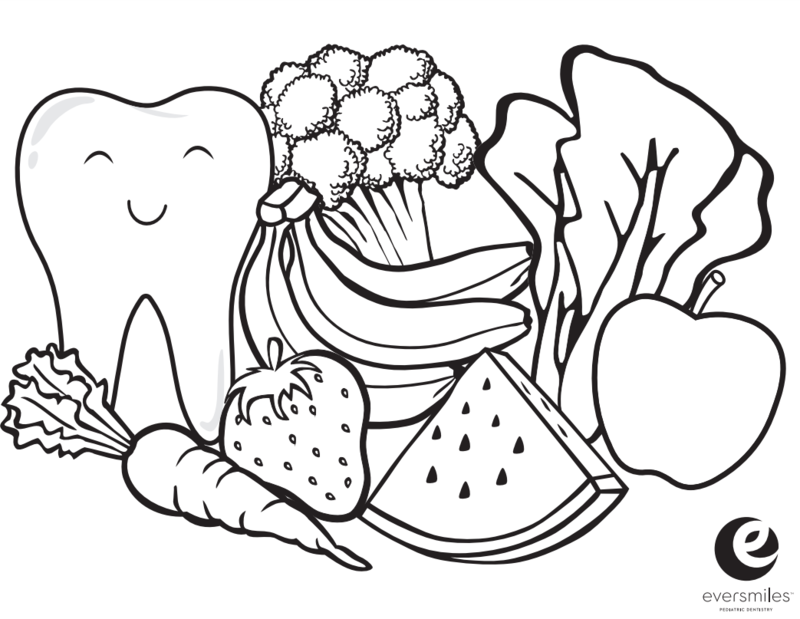 Feel free to click here to print off this coloring page to promote healthy eating and dental habits! Oral bacteria is passed from caregiver to infant. For this reason, avoid sharing food (pre-chewing), oral items, or rinsing dropped pacifiers in your own mouth, especially if you have dental restorations or a history of decay. Advise other caregivers that your child may encounter to do the same. Keep your mouth healthy – chronic inflammation is linked to other systemic health risk factors, which can affect fetal health. Make it a goal to wean off night feedings prior to the eruption of your baby’s first tooth, should your child’s health permit it. As your child grows, should you choose to offer juice, time the juice to coincide with a meal. Avoid offering juice if possible, especially between meals, and reserve it as a treat for special occasions. Use infant bottles for water, breast milk or formula only. When traveling, we recommend bringing water, breast milk, or formula, as needed for your child’s age. Fluoride toothpaste is recommended for all children, even those who cannot spit. Use a small amount (about the size of a grain of rice), smushed onto the toothbrush, and store toothpaste out of reach of children. Start off slowly, with nighttime brushing, and gradually build daily brushing into your child’s routine. If your child has special dietary requirements (e.g. Pediasure, nasogastric tube) or medications (e.g. albuterol, vyvanse), we can help you manage oral health and talk about how best to deliver supplemental nutrition and medication to prevent decay. 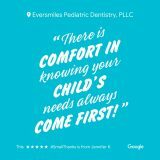 Our goal is to instill healthy habits early on, to help every child remain cavity-free for life. Ultimately, if your child has decay, do not feel guilty. We are here to work with you as a member of your child’s healthcare team. Together, we can give your child a fresh start, and manage his or her disease going forward. For more information about the role of pediatric dentists and ideas for better oral health, please visit “Mouth Monsters” where they have plenty of Parent Resources.